In the last lesson, Lesson 42, we started looking at Vedic Sanskrit. We said that the term Vedic Sanskrit refers to the metrical language of the Vedic hymns and the prose of the Brāhmaṇas and the Brāhmaṇa-like portions of the various recensions of the Yajurveda and the Atharvaveda. One of the key aspects in which Vedic Sanskrit differs from Classical Sanskrit is the use of accents. The ancient Sanskrit accent is described as being dependent on a variation of pitch or tone. It is never described the the grammarians as a difference of stress, as it is in English. The tones or pitches are called svara स्वर in Sanskrit. There are three tones or svaras on vowels. The udātta उदात्त (meaning “raised”), the anudātta अनुदात्त (meaning “not raised”) and the svarita स्वरित (meaning “sounded”). The udātta is a high tone or pitch, the anudātta is a low tone and the svarita is like a circumflex accent. It is a combination of a high tone and low tone (the tone rises and then falls). Normally, in a word, only one syllable is accented (there are a few exceptions to this rule, where in a word two syllables are accented). [When I say, that a syllable is “accented”, I mean that, that syllable has the udātta उदात्त or “raised” tone.]. In a syllable it is the vowel that has the accent. There are two types of svaritas, the enclitic svarita and the independent svarita. An udātta is normally always (there are some exceptions) followed by a svarita, called the enclitic svarita. The enclitic svarita is merely a shadow following an udātta. Also, an enclitic svarita, loses its character and becomes an anudātta, if the accent (udātta or independent svarita)of the following word follows immediately after it. in téna तेन॑ and té ca ते च॑, the enclitic svarita is marked on the na and ca after the accented té. However, in téna té तेन॒ ते and té ca svàr ते च॒ स्व॑र् the na and ca are marked as anudātta, because of the following udātta and independent svarita. The independent svarita is secondary, being a combination of an udātta vowel and a following anudātta vowel (in sandhis). The independent svarita is takes the place of the main accent of a word, and it retains it character always. Let us take the word ratnadhā́tama र॒त्न॒धात॑म; This word has the main accent, the udātta उदात्त, on the vowel ā́ of the syllable dhā́ धा. The accent is marked only in manuscripts of the ancient literature – the primary vedas or Saṃhitās, the Taittirīya and the Śatapatha Brāhmaṇas, the Taittirīya Āraṇyaka, parts of the Aitareya Āraṇyaka and the Suparṇādhyāya. 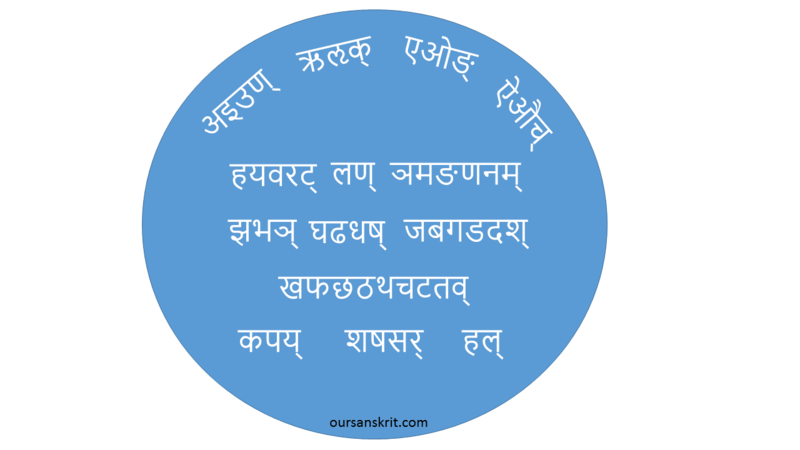 There are various methods of marking the accent in the Devanāgarī script. We will follow the most popular method – the one found in the manuscripts of the Rigveda, the Atharvaveda, the Vājasneyi Saṃhitā and that of the Taittirīya Saṃhitā, Brāhmaṇa and Āraṇyaka. In this method, the main accent, the udātta is left unmarked. The anudātta just before an udātta or an independent svarita has a horizontal stroke under it. The svarita, independent or enclitic, has a short perpendicular stroke above it. Let us take the word ratnadhā́tama र॒त्न॒धात॑म. The धा with the udātta is left unmarked. The त्न॒, with the anudātta just before the udātta is marked with a horizontal stroke under it. And, the enclitic svarita just after the udātta, is marked with a perpendicular stroke above the syllable. tvā त्वा॒ (anudātta on त्वा॒. no udātta). Note that the enclitic svarita is marked after an udātta only if there is a syllable following the udātta syllable. Note that if the word begins with an udātta, there cannot (obviously) be an anudātta before it. So any syllable left unmarked at the beginning of a word is considered to have the udātta. Following the same logic, if a word begins with several continuous anudāttas before an udātta, they all have to be marked with the stroke below. Again, all continuous anudāttas after a svarita, are left unmarked until the occurrence of the next udātta or independent svarita. The anudātta just before this udātta or independent svarita is marked with the stroke below. In the Latin script that we use, the udātta is shown by an acute accent over the accented vowel, and the independent svarita by a grave accent over the vowel. Anudāttas and enclitic svaritas are not marked. We are not quite clear how exactly the ancients rendered the tones or accents. We can only guess. It is clear that the syllable with the udātta is rendered in a tone or pitch that is higher than the rest of the syllables in the word. Here I have rendered ratnadhā́tama र॒त्न॒धात॑म in my (non-musical) way. For food thee, for strength thee! Ye are winds, ye are approachers. Let the god Savitr impel you to the most excellent offering. O invincible ones, swell with the share for the gods, Full of strength, of milk, rich in offspring, free from sickness, from disease. Let no thief, no evil worker, have control over you. Let Rudra’s dart avoid you. Abide ye, numerous, with this lord of cattle. Do thou protect the cattle of the sacrificer. I have attached here a tradition of chanting the above: both the Saṃhitā and the Pada-Pāṭha in two different traditions. There are many other traditions of rendering the accented texts. I would assume sama veda uses this method too? Or is there a bit more that should be considered? The Sama Veda uses a different approach. It uses the figures 1,2 and 3 written above the syllables to mark the accents. Please see Macdonell.